I am so very happy to see this coming out in a collected edition from Fanta, as the individual issues were fantastic. I also had the pleasure of meeting Georgia on tour, at an event where we were asked to remain silent and speak only via writing on pieces of paper. It was extremely powerful. After abruptly learning that she must rest her voice, Georgia copes with changing her entire life in visuals that depict her challenges extremely well. 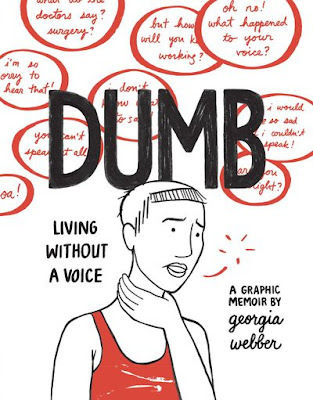 Georgia uses the visual medium to show how hard it is to go from being able to speak freely to knowing that every syllable is precious. 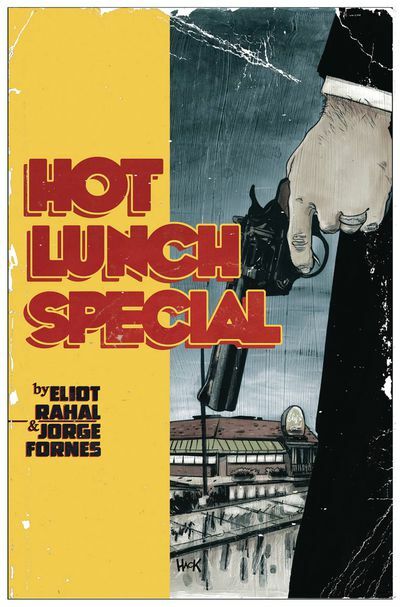 It's a great memoir, but also a solid example of how comics can bring a story to life in a way other mediums cannot. This one gets my highest possible recommendation. Ben Passmore is best known for Your Black Friend and also for doing great work on nonfiction comics essays, but he's also pretty good at just being weird. This is Ben just being weird, with a cover that's guaranteed to tell you if you have any interest in reading these strange stories that, per the solicit, include Ben turning into a cockroach. Gory and punk abounds, and I'd expect nothing less from Silver Sprocket. It's time for a Masquerade, but things aren't going well, as our lodge mates struggle to keep their friendships intact when decisions get in the way. 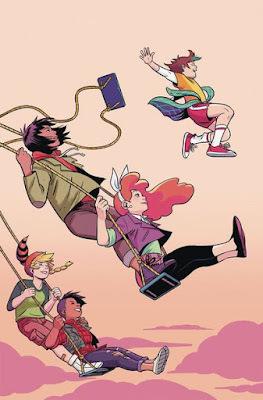 But because this is Lumberjanes, weird stuff happens and the next thing you know, actual fairies enter the mix! It's yet another romp, and I really dig the art here by Maddi Gonzales, who isn't afraid to go the extra mile for the comedic exaggeration. I'm an easy mark for Lumberjanes stuff, and this is no exception. One of the single most consistent series on the racks right now, from single issues to specials like this one. It's the all-American story--an immigrant family becomes a success by selling pre-packaged sandwiches in vending machines. Except they didn't quite get there completely on the up-and-up. When the mob comes to collect their due, the family must find a way to put aside their differences and fight back in this noir story that sounds incredibly cool to me. I don't know much about the creative team, but I'm completely sold on the premise. Without a lot of fanfare, Aftershock is putting out books that are definitely interesting, at least for this reader. 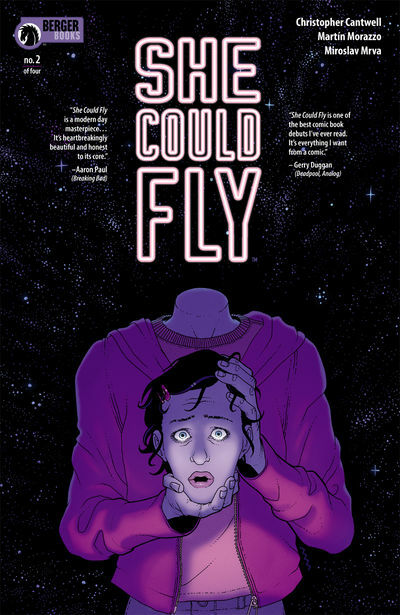 Luna's mental issues mix with her obsession with the flying woman, leading to trouble at home and school. Meanwhile, a former employee of a shady corporation looks for clues while trying to stay one step ahead of his pursuers. Things are coming together, yet still shrouded in mystery as this second issue builds on the first. Cantwell's plotting here is extremely complex, but it also means that if he can't pull the pieces together there will be problems as we reach the ending. But I'm hooked on the mystery of how this all fits, and Luna is a great main character. Morazzo's art is the weakest so far in this Berger Books line--it's very stiff, and while the strange parts come out okay, I keep wishing for a more dynamic take on the talking heads portions of the story. It's the most stereotypical Vertigo House style we've seen so far. Still, I'm interested to see where this goes and I trust Karen Berger. Fantastic Four #1 by Dan Slott and Sara Pichelli, published by Marvel Comics. This is it. 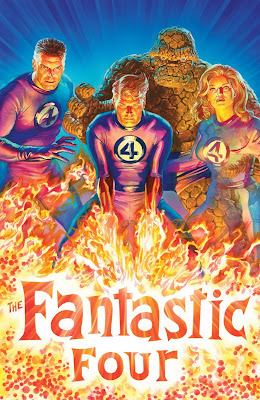 The Fantastic Four are finally returning. And I am thrilled about it. They disappeared at the end of Secret Wars in 2016 and the Marvel Universe hasn't been the same without them. We've gotten Johnny and Ben in various stories, but it's not the same. The FF are a team but more than that, they're a family. The family of the Marvel Universe. 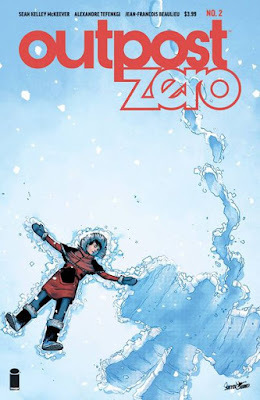 I miss them, and more than that, I frankly miss the last great run they had, written by Jonathan Hickman and illustrated by Steve Epting and others. I've got high hopes for this new run. I'm not sure if Dan Slott can reach the mind-bending architectural heights of Jonathan Hickman, but I know he's got an incredible grasp on Marvel continuity and a love for the characters, and he's not afraid to try out all sorts of things. And Sara Pichelli is a spectacular artist. So, I'm excited for this. 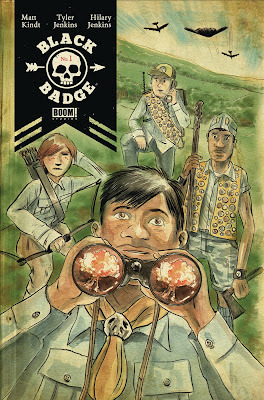 Black Badge #1 by Matt Kindt, Tyler Jenkins and Hilary Jenkins, published by Boom! Studios. I've read the first issue of Black Badge and it is a lot of fun. Here's the premise: there's an elite group of Boy Scouts that, once they've earned all of the regular badges they can earn, become part of what is known as the Black Badge. Basically, Boy Scouts taking on espionage/intelligence missions, for an unknown organization. It's a fantastic premise and I absolutely recommend this first issue. First off, a story written by Matt Kindt about a secretive organization? If you know anything about how I feel about MIND MGMT then you know I am here for this book. Secondly, I'm a huge fan of Tyler Jenkins' work - I loved the work he did on Peter Panzerfaust and also on his previous collaboration with Matt Kindy, Grass Kings. In that book, Jenkins used a really soft watercolor approach to the storytelling. Here, he's colored by his wife Hilary Jenkins who takes a more vivid and grounded approach to colors that suits the story really well. This is an effective debut issue as I'm left with lots of questions and absolutely wanting to know more. I think you'll feel the same way. 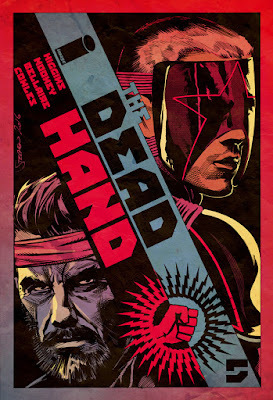 The Dead Hand #5 by Kyle Higgins, Stephen Mooney, Jordie Bellaire and Clayton Cowles, published by Image Comics. This is the best spy series that is I think flying under the radar. It shouldn't be though. It's got a fantastic premise and great storytelling from Kyle Higgins, that's brought to life with fantastic art from Stephen Mooney and Jordie Bellaire. It's espionage meets, well, I don't want to give too much away, but there's a really great hook to the series. If you like spy stuff you should definitely be reading it. Sandman Universe #1 by Neil Gaiman, Various, published by DC Comics. 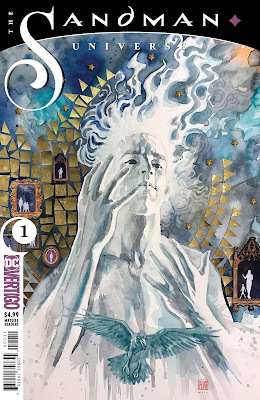 I'm not one of these huge Sandman people but I enjoyed the series when I read it (around 10 years ago) and I also really enjoyed the incredible prequel series from a few years ago (illustrated by the astounding J.H. Williams). I'm sure that if I'd been reading the series (or comics generally) when it was coming out, it would have seemed more revolutionary to me. But it's a wonderful, fertile world, with tons of ideas to explore, so I'm curious to see what new ideas and stories that Neil Gaiman and others have to tell. Issue 1 of Relay ended on a cliffhanger, and issue two of this series takes things in an entirely unexpected direction. The strengths of this book are many, but they are crowned by the work of Clarke and Villarubia who continue to create wonderfully retro animation style visuals. While even good space opera is sometimes derivative, Thompson, Bromberg, and Cates’s story is an original, and still piques my interest. I enjoyed the first issue of the series. McKeever’s story is strong enough, but the selling point is newcomer Alexandre Terenkgi's line art coupled with Jean-Francois Beaulieu’s color work. It’s expansive and stark at the same time, echoing the setting of the barren frozen wilderness. It’s criminal that we’ve suffered for this long without a Fantastic Four book because of what seems to be petty in-fighting. 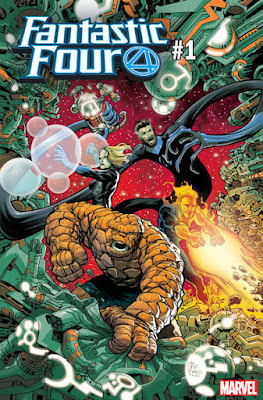 While FF isn’t necessarily my favorite book, I’d probably include certain runs among my all-time favorites. It’s about time we have the first family back. 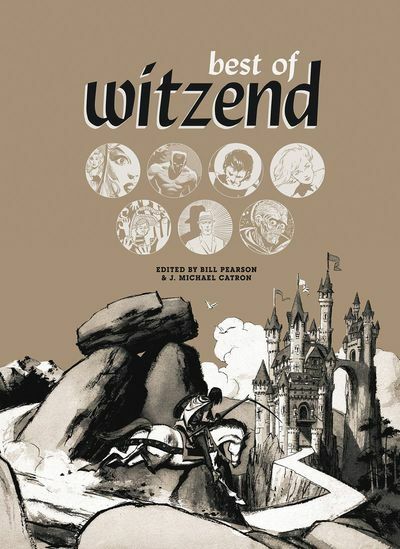 In the 1990s, prominent creators left Marvel to start Image Comics, but in the late 60s, big name creators brought their talents to Wally Wood’s alternative publication, witzend. While Image represented more of an economic declaration than a stylistic on, Wood’s cast of characters – Steve Ditko, Howard Chaykin, Bernie Wrightson, Frank Frazetta, etc – looked to expand their own creative possibilities. In a time were the line between the underground and the mainstream was far thinner, these creators saw that comics could be much more than superhero punch ups. Last week I mentioned that that I was blindly all in with the Berger Books line of titles coming out of Dark Horse and this book is exactly the reason why I have so much trust in it. She Could Fly took me completely by surprise. It focuses on Luna, written by Cantwell, (from AMC's Halt and Catch Fire) doesn't hold back as we see the world through her varying mental health issues that make for a very frightening lens. She fights back urges that compel her to inflict pain on herself and other as she fights through crippling self-doubt. This is already a captivating premise for a story to be told in the comic medium. 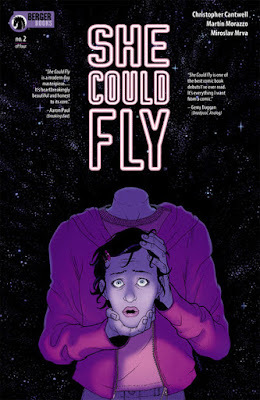 Meanwhile, a peripheral story emerges where a woman who could inexplicably fly appears in the sky over the city. An unexplainable flying woman who explodes in a ball of fire, leaving the city of Chicago with lots of questions, and sets Luna down an obsessive path. 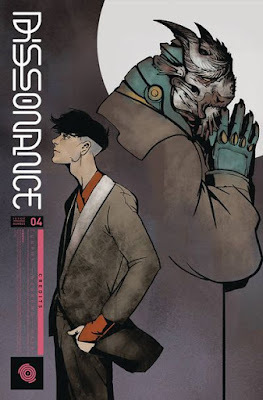 Dissonance is a comic that I feel like a lot of people are sleeping on because they don't know what to make of the book's captivating character designs. If you are a fan of high concept sci-fi in the vein of China Mieville, this title is absolutely for you. 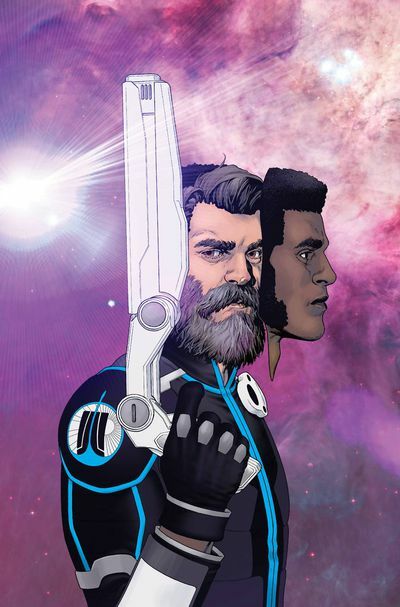 I feel that this creative team is taking their influences and running wild with them, trying to visually conceptualize a fantastically bizarre alternate Earth where Humans have joined with a spirit - based space race to create a new hybrid species. I know that's a lot to throw at the casual reader, but the politics surrounding our main characters that belong to a secret cabal that run the world actually make it easily digestible. I realize that all these elements make this comic seem incredible niche, but come for the art design and stay for the political backstabbing ala House of Cards. I mean, like… DUH. Ok. What can I tell you that will make you even more excited for this return than you and everyone else already are? Well, to start off, this creative team. You could put Sara and Dan together on a book about the invention of pajamas and I would give it a chance. Sara brings a vibrant energy to her art and is able to make the most legacy-burdened of superhero characters feel fresh again. Dan has proven that he has a love and strong understanding of what the stranger, cosmic side of the Marvel Universe is capable (his Silver Surfer series with Mike Allred is criminally underrated and was arguably a near-perfect run). I’m also a huge proponent that competition creates greatness. 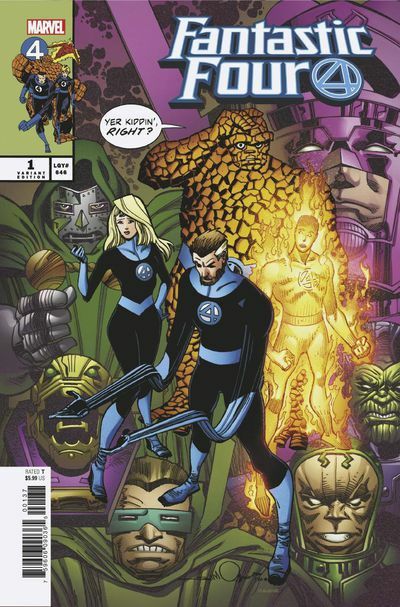 There’s already a great Fantastic Four comic being published over at DC called The Terrifics being written by Jeff Lemire, who is currently at the top of his game and probably hasn’t peaked yet. A world where both these books exists at the same time is exciting for comic readers that are fans of the potentially more bizarre spaces that occupy the Big Two comic publishing worlds.